NCHRP 350 FLEAT – RSI - Road Systems, Inc. The FLEAT (FLared Energy Absorbing Terminal) is an energy-absorbing flared terminal. The flare is straight and the offset is variable anywhere between 2′-6″ and 4′-0″. The FLEAT is 37′-6″ long and has 7 posts. NCHRP 350 APPROVED! The FLEAT combines the superior performance of the energy absorbing tangent terminals with the advantage of flared terminals in reducing nuisance impacts. During head-on impacts, the FLEAT head slides over the W-beam guardrail. The rail is sequentially kinked or bent as it moves through the head. 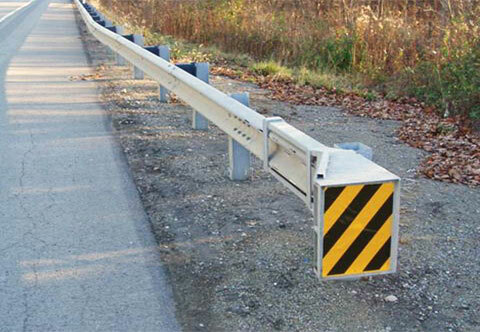 The kinked guardrail exits the head safely and the vehicle is brought to a controlled stop. When impacted along the side within the length-of-need, the FLEAT functions like guardrail. The errant vehicle is safely redirected back toward its original travel path. The FHWA has recommended that all non-energy-absorbing flared terminals have 200 feet or more of barrier proper in advance of the fixed object to allow for the vehicle to travel behind and beyond the end of the terminal. When impacted end-on, the kinetic energy is able to be absorbed. With non-energy absorbing terminals, the errant vehicle may travel nearly the length of a football field behind and beyond the end of the terminal. The FLEAT has significantly fewer small components than any other flared terminal. This substantially reduces the installation and maintenance time. The flare can be optimized to fit the site conditions. The flare is variable anywhere between 2′-6″ and 4′-0″. This may reduce the need for costly site grading. The FLEAT is available from multiple distributors. This means the end of sole source supply. About 10 seconds of small car end-on impact. The FLEAT meets NCHRP 350 Test Level 2 criteria. All of the components are the same as the Test Level 3 (100 km/hr) design. The length is simply reduced. These Test Level 2 designs will cost less to supply, install and maintain. August 20, 2004 SKT & FLEAT Steel Post Hinged With Single 3/4″ Bolt.